When Dr. Allen Lim left the lab to work with pro cyclists, he found a peloton weary of food. For years the sport's elite athletes had been underperforming on bland fare and processed bars and gels. Science held few easy answers for nutrition in the real world, where hungry athletes must buy ingredients; make meals; and enjoy eating before, during, and after each workout, day after day. So Lim set out to make eating delicious and practical. His journey began with his mum, took him inside the kitchens of the Tour de France, and delivered him to a dinner party where he met celebrated chef Biju Thomas. Chef Biju and Dr. Lim vetted countless meals with the world's best endurance athletes in the most demanding test kitchens. Now, in The Feed Zone Cookbook: Fast and Flavorful Food for Athletes, Thomas and Lim share their energy-packed, wholesome recipes to make meals easy to prepare, delicious to eat, and better for performance. 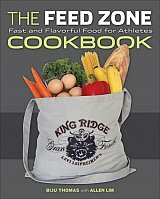 The Feed Zone Cookbook provides 150 delicious recipes that even the busiest athletes can prepare in less time than it takes to warm up for a workout. With simple recipes requiring just a handful of ingredients, Biju and Lim show how easy it is for athletes to prepare their own food, whether at home or on the go. 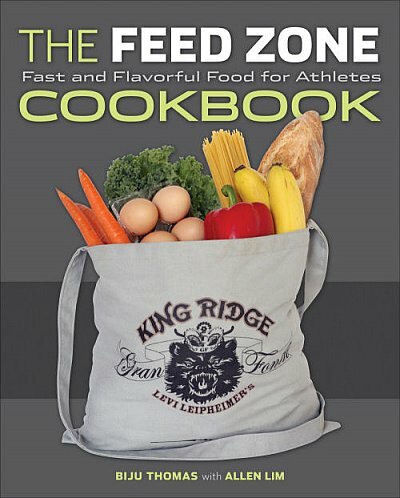 The Feed Zone Cookbook strikes the perfect balance between science and practice so that athletes will change the way they think about food, replacing highly processed food substitutes with real, nourishing foods that will satisfy every athlete's cravings.